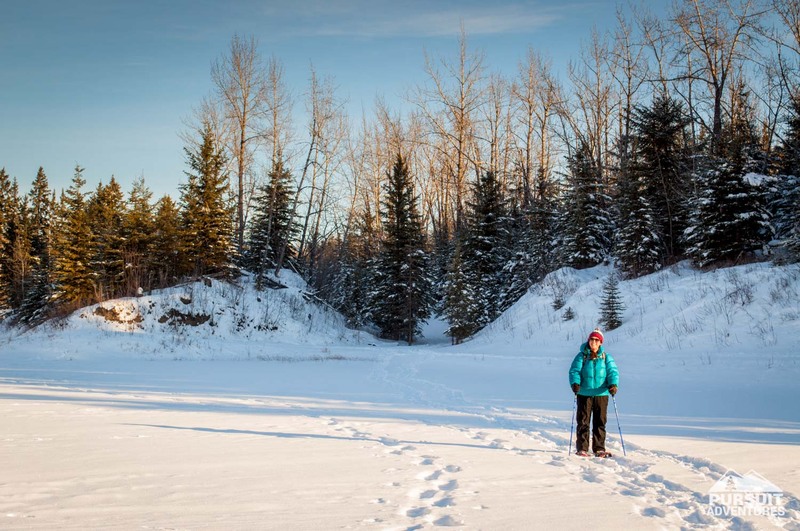 Heritage Ranch and the Waskasoo Parks in Red Deer offer lots of options for snowshoeing and winter walks. 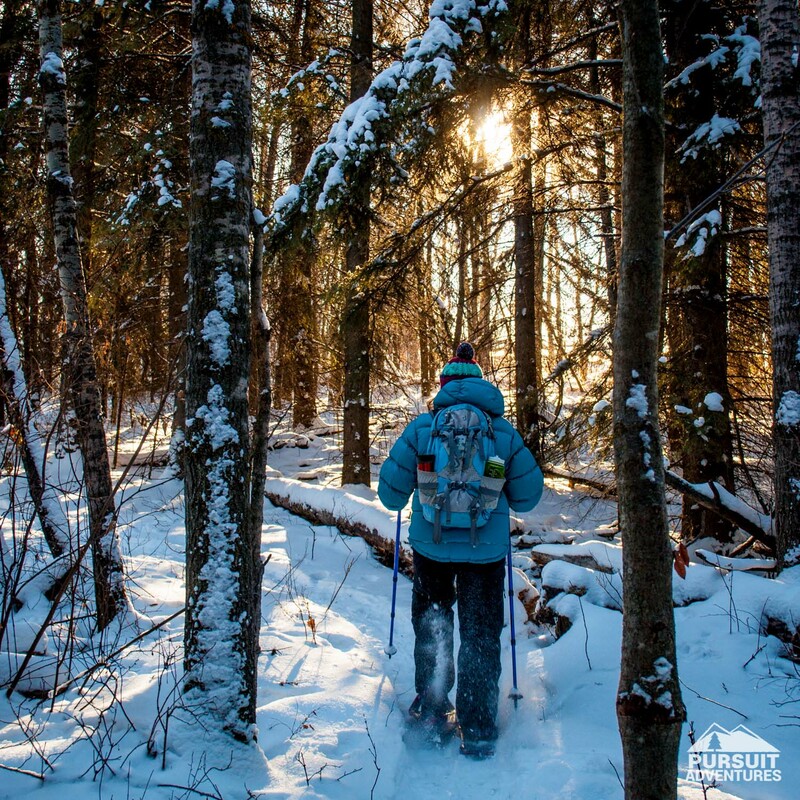 This loop is our usual route for the popular Snowshoe in the City evening tour, taking us through the forest on narrow trails before reaching the fishing pond where we spend time stargazing. It’s a great option for all ages at any time of the day. If you’re looking for a longer outing you can easily explore the many side trails you’ll encounter along the way. 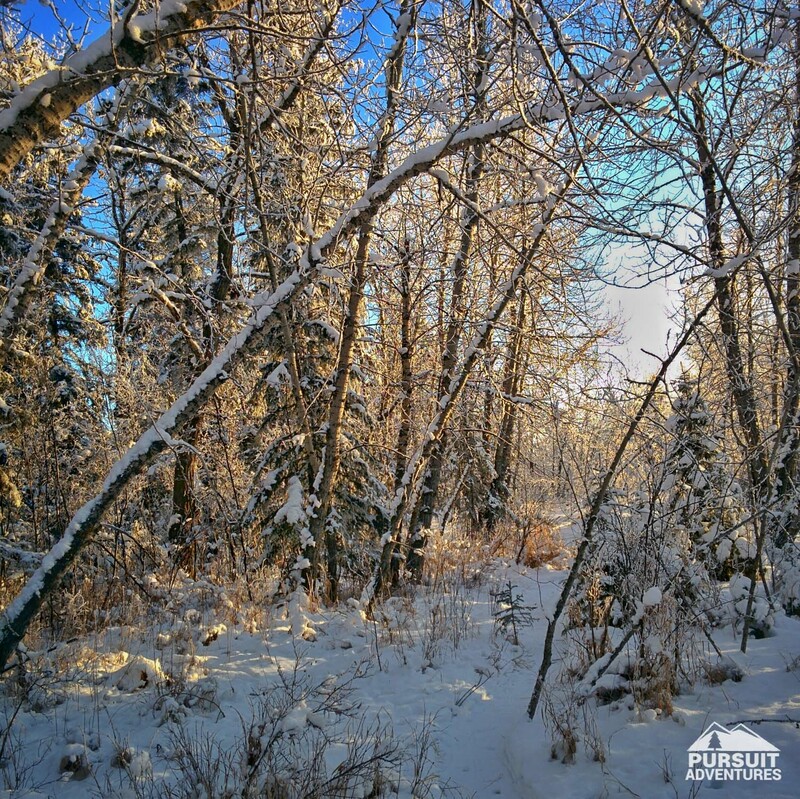 Some of the trails are unofficial trails and can be harder to find, especially after a fresh snowfall. The area is not usually overly busy but the sound of Highway 2 is noticeable. The area has tracks set for cross country skiing. Make sure to step over the tracks to leave them set for skiers in the area. Trail conditions can change quickly.  The map and directions below are based on our experience snowshoeing in the area throughout the winter. 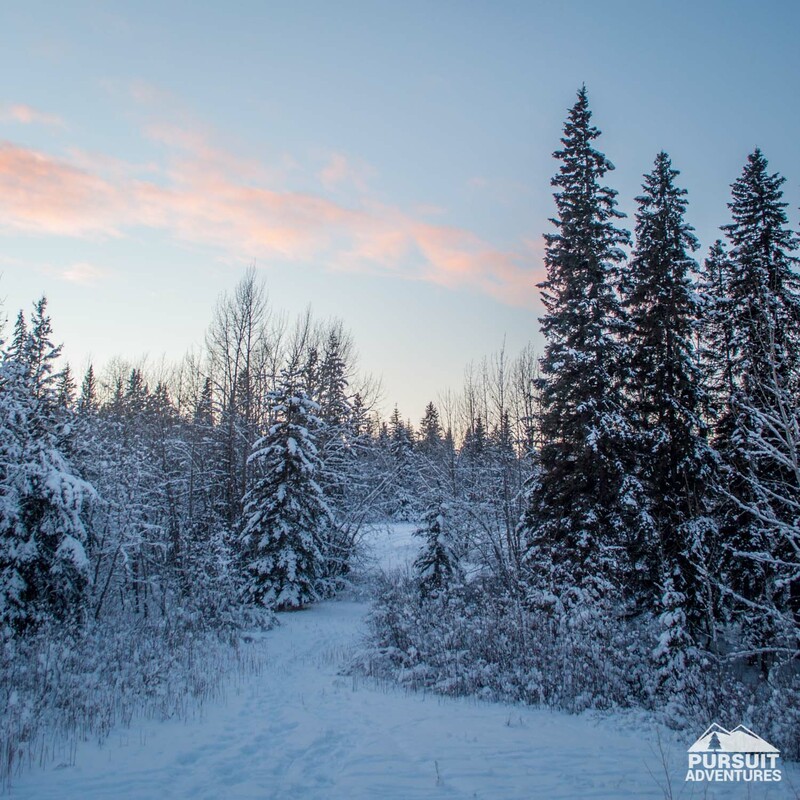 The multi-use trail is usually groomed for cross country skiing after each snowfall. Trailhead: Heritage Ranch parking lot. Public washrooms. Trailhead: The parking lot at Heritage Ranch can be accessed through the Westlake neighbourhood on Cronquist Drive and Webster Drive. Access is also available from the Visitor Information Centre and the Alberta Sports Hall of Fame on Highway 2. Follow the path from the parking lot, crossing the pedestrian bridge overlooking the horse corrals. 0.2 km | At the intersection, follow the narrow trail into the trees before the cross country ski trail sign. 0.5 km | At the bench, follow the trail into the forest on your right. 0.7 km | Go left to stay on top of the ridge at the junction. 0.9 km | Multiple trails on the left lead back to the multi-purpose trail. Keep right. 1.5 km | Walk past the trails on the right into a clearing and turn left to into a cutline. 1.7 km | Make your way across to picnic area to the pond. 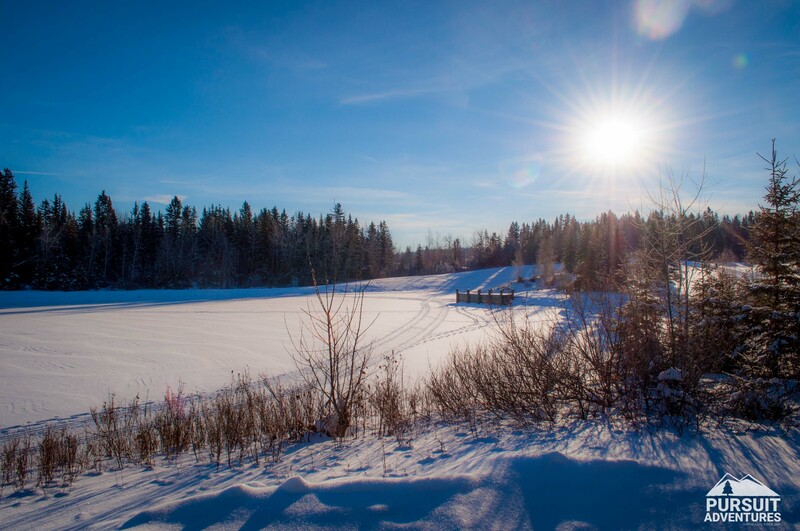 1.9 km | Make your way onto the pond and explore around the island. 2.6 km | Make your way off the pond into the carriage road heading past the shelter toward the field. 2.6 km | Cross the field, heading toward the road at the end of the field on your left. 3.1 km | Watch for a narrow trail on the right heading into the forest. 3.6 km | Turn left onto the service road and follow the path between the service road and the multi-use trail at the snow fences. 3.9 km | Go left at the junction to end your hike at the Westlake Grill. 4.1 km | Westlake Grill. Start from the trail at the corner of the parking lot closest to the Alberta Sports Hall of Fame and the Visitor Information Centre. The trail heads up toward a pedestrian bridge overlooking the horse corrals. Follow the trail to the junction ahead, where the cross country ski trails start. At the junction, just before the cross country ski trail sign there is a smaller path heading into the forest on your right. Follow this trail as it stays close to the edge of the river valley, closely following the multi-purpose trail. The trail soon comes up to a bench along the main trail. Follow the trail into the forest and down toward the valley. At the next junction, the trail on your right heads straight down the hill. This is a shorter way to access the lower grounds and a trail we will meet again later. For now, stay on top of the ridge and follow the trail on the left. From this point on you’ll come across many trails on the left, all leading back to the multi-purpose path. Keep right as you meander through the forest. At 1.5 km the shortcut from earlier merges with this trail. A few step further the trail appears to take a sharp right. This trail heads toward the bridge over the Red Deer River and Great Chief Park. Go straight instead, walking into a small open area where you will see a trail heading into a cutline on your left. Follow this path to the picnic area. The path comes out at the cross country ski trail. Cross the trail, being careful not to damage the groomed tracks, and head straight across toward the picnic area. There are washrooms available here, along with fire pits (you need to bring your own firewood if you are planning to have a fire) and tables. Make your way to the pond from there. Make your way onto the pond. The ice throughout the winter is usually stable and is part of the groomed cross country ski trails. Make your way around the island, enjoying the quietness of the area. On an evening walk this is a great spot to make some snow angels while stargazing. From the pond, follow the carriage road past the shelter (on your left) and head toward the open field ahead. 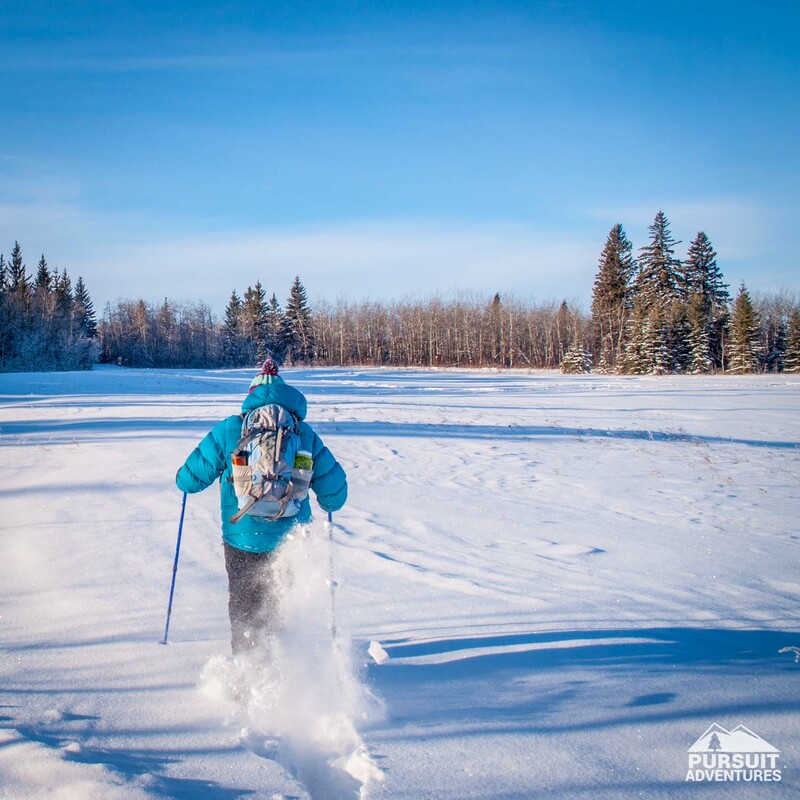 The field is the perfect place to play in the deeper snow as you make your own tracks heading straight across toward the service road. Take a few steps on the service road, keeping an eye for a narrow trail on your left heading into the trees. If you make it to the curve on the road heading uphill you’ve gone too far. The trail zig-zags between the multi-purpose trail and the service road, slowly making its way back up to the upper grounds. Throughout the holiday season this is a great spot to catch the winter lights setup for the sleigh rides offered by the ranch. At the top of the hill, the trail emerges onto the service road. Turn left and follow the road to an open area with snow fences. If you encounter horses, stop on the side of the road and turn off your headlamp. 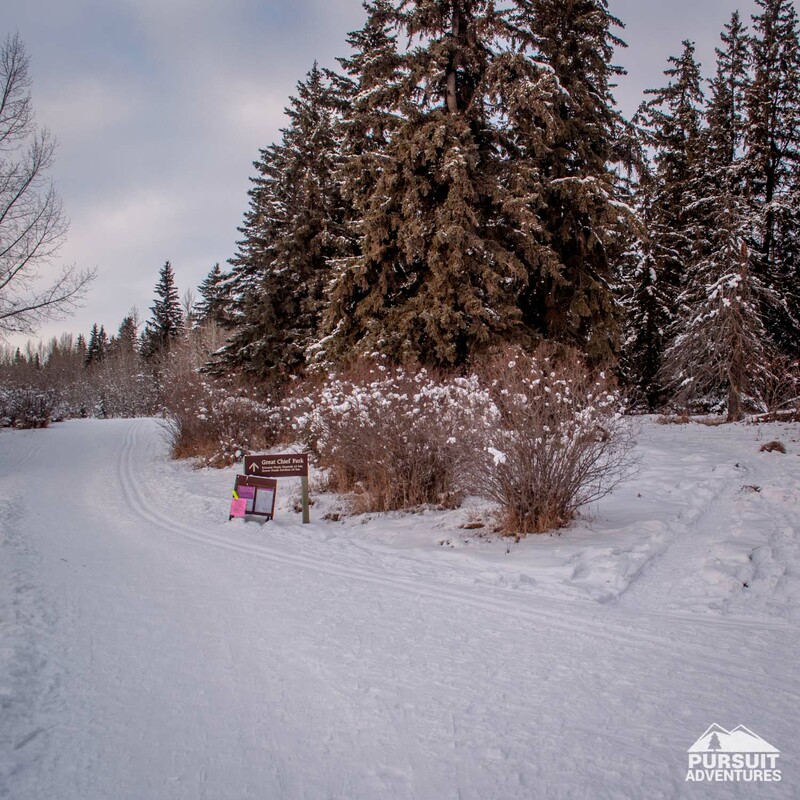 At the snow fences, follow the narrower path between the service road and the multi-purpose trail all the way back to the junction near the ranch. Head back directly to the parking lot by following your tracks across the bridge or follow the trail straight ahead to make your way back to the Westlake Grill for an apres-snowshoe. For your safety and the protection of the area please follow trail signs, stay on the trail and respect all trail closures. Be respectful of wildlife and familiarize yourself with wildlife safety techniques including making plenty of noise, keeping your pet on a leash and keeping your group together. Information provided here may be inaccurate or outdated. Always make sure to obtain current trail information before going on your adventure.